If you have not read about USA Ultimate's recent update to its bylaws, you're probably not alone. 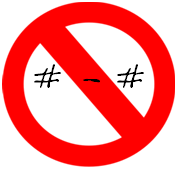 Who's got time to read a non-profit's bylaws, anyways? As its operating manual, one can actually determine a lot about the organization's priorities. See below for a condensed version of an important article - especially if you're a USAU member. Members should be proud of USA Ultimate being forward-thinking. Growth management requires work, and USAU is not only striving for growth, they are planning for it! The multifaceted issues that USAU face are short-, medium-, & long-term goals. 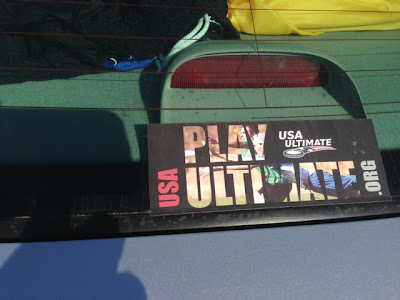 Best of all, USA Ultimate has a vision for the present, for the next few years, and for the future. Inclusion of Ultimate as an Olympic sport is at least 20 years away (2033). 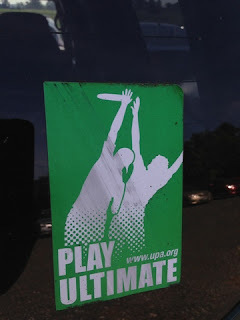 Ultimate is currently played in 56 countries; below the strict requirement that a sport must have national governing bodies with male participants in at least 75 countries on 4 continents, & female participants in at least 40 countries on 3 continents. Only 28 sports are allowed, so there is currently no room for Ultimate an as Olympic event. USAU board seeks not just willing volunteers, but leaders "with the right perspectives and expertise to make smart decisions"! Utilization of constituency-represented committees as liaisons to the board. Elimination of geographic region representatives; only 4 At-Large positions will be part of the general election. The total number of board directors (12) stays the same, but the composition of the board will be reconfigured, with dedicated player representation at 25%. 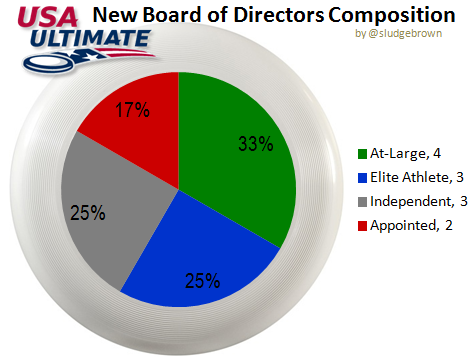 New Composition of USAU Board within 3 years. In 1998, 1 full-time staff; in 2013, 14 FT staff. A division of labor and responsibility exist for staff and the board. They have plans & they plan to use them - Strategic Plan (2013-18), Operating & Business plans. Financial management practices, including a 'Rainy Day Fund', have been established. Protection, legal rights and insurance of players, members, events are covered. SOTG is essential to the future of the sport. "Make SOTG real for today's Ultimate players and community"
Look for recommendations from the Spirit, Observers, and Rules Committee to make the sport more "TV-friendly." "Key partners in the world of sport (the International Olympic Committee) and media (ESPN) agree – they feel that SOTG is the most important aspect supporting future growth of Ultimate!" 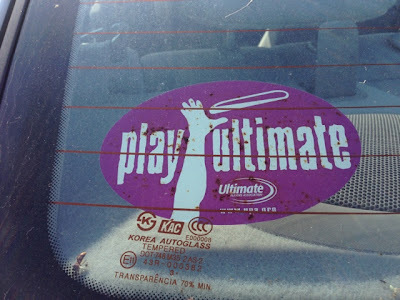 Disclosure: I am an Ultimate player and a dues-paying USA Ultimate member. 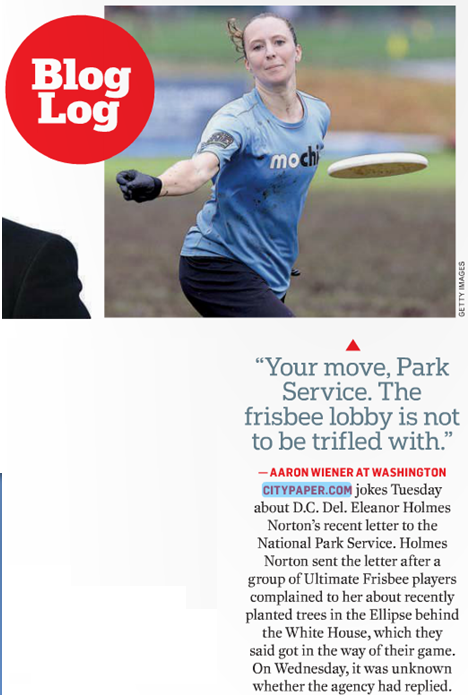 How great to see The Washington Post daily newspaper, Express, mention Ultimate Frisbee again! Today's Express Blog Log (page 24) features a quip from the Washington City Paper regarding the on-going issue of trees on an Ultimate field. "Your move, Park Service. The frisbee lobby is not to be trifled with." - Aaron Wiener. Video footage of 1985's UPA Nationals in Washington DC rolls as Howard Cosell opines on Ultimate Frisbee, during his ABC Sports program "Sportsbeat." Nearly 30 years later, some thing$ have not changed. Starting at 0:33, "This is known as Ultimate Frisbee. And it's played seven to a side. And, combines elements of football, soccer & basketball. Unlike those sports, though, you'll find no referees on the field." Starting at 0:47, he expresses: "And the ultimate reward for their time, money and effort? Nothing. Nothing; save the joy of competition. A refreshing reminder of what sport was meant to be. And, still, on rare occasions can still be. The ultimate winners? Well, they were all winners." For the record, Flying Circus (open) & Condors (women) won the 1985 national championships. Ever wondered about ALL the Ultimate events happening ALL across the country? 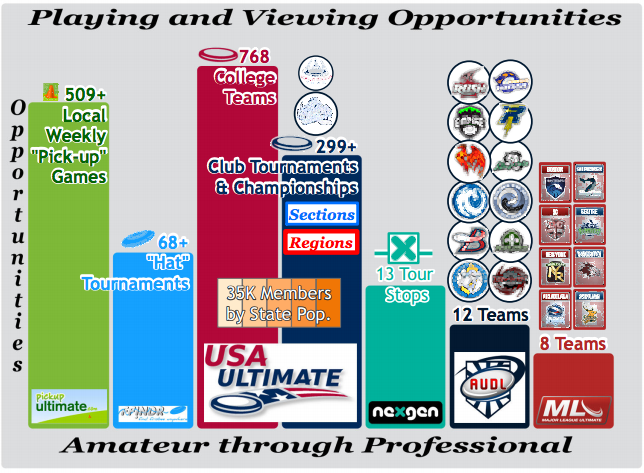 Well, Nathaniel Morton just awesomely mapped all the games of pickup, hat tourneys, USAU, NexGen, AUDL, & MLU for 2013. In MLU off-season news, it was learned that an individual can part own an MLU team. 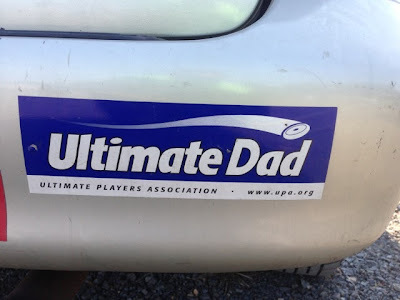 For the DC Current, the "part owner" is someone who has been involved with professional Ultimate since the AUDL began. Welcome, Mark Evangelisto - the recently announced "part owner" of "the DC Current organization". Mark is a former Rhode Island Rampage staffer (& AUDL referee), and most recently was the General Manager of DC's rival Philadelphia Spinners. "...My belief in this vision has led me to this next chapter as an investor in the league with the DC Current. I look forward to helping MLU grow and flourish in this new role. I’ll bring part of my Spinners spirit with me to DC and will look to see the team complete what it started last season where they fell a little short against the Boston Whitecaps in their quest for the MLU championship." 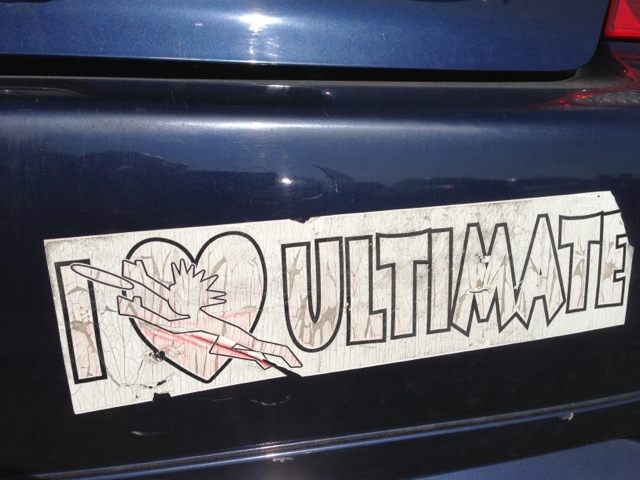 Ultimate is a dynamic sport that deserves an equally compelling method of reporting game scores. Think about the final score of an ultimate game: winning team, final tally, and (with some math) margin of victory. By itself, the final game score is a mere snapshot of the game and lacks any real context. 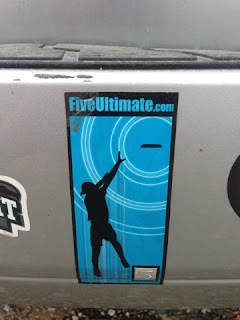 The sports norm is reporting just the final scores; however, ULTIMATE IS BETTER THAN 2 NUMBERS SEPARATED BY PUNCTUATION! Our sport of ultimate is often compared to other sports, but that should not dictate our need to follow the template of team sports. Here's an opportunity for ultimate to take the lead on how game scores are reported. Ultimate should become the paragon (yes - the paragon!) of athletic score reporting. Data collection for tracking game points and player stats [examples: Leaguevine, Ultiapps, et al] are valuable to grasp trends, rises, falls, and ties during the evolution of the match. Let's not hide those delicious data morsels, let's share them. Moreover, I would argue that expanding score reporting may be an approach to reach out to a larger audience (more fans! ), and/or be more attractive to sports broadcasting channels (more exposure!). For ultimate games played to a point cap, consider one of these slight improvements to basic final score reporting. Besides knowing the winner/loser & final score, this provides valuable details at specific benchmarks of the Ultimate game. IMPROVED: Win; 5-3, 9-10, 15-11. /or/ Win; 5:3, 9:10, 15:11. CURRENT: Win 15-12 /or/ Win 15:12. "scoRECAP": 0-0, 2-0, 2-1, 6-2, 7-4, 8-5, 11-5, 13-6, 14-11, win 15-12. /or/ 0's, 2:0, 2:1, 6:2, 7:4, 8:5, 11:5, 13:6, 14:11, win 15:12. Ultimate games with timed quarters (e.g. pro leagues), should adopt a quarter-by-quarter summary to their final score reporting. An element of score reporting time-driven matches (basketball, football, hockey) is following their advancement, so it's an obvious fit. Our current system of score reporting is too simple and is not reflective of the dynamic nature of our sport. I ask all ultimate players, teams, leagues, tournaments, organizations to consider these improvements in order to collectively progress the ultimate sport by using a supplemental reporting of scores. 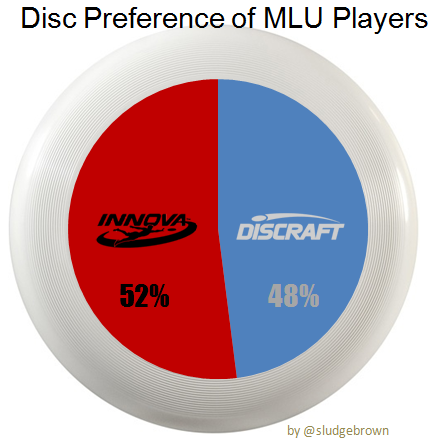 The pro Ultimate seasons are over, so we know who won the AUDL & MLU. 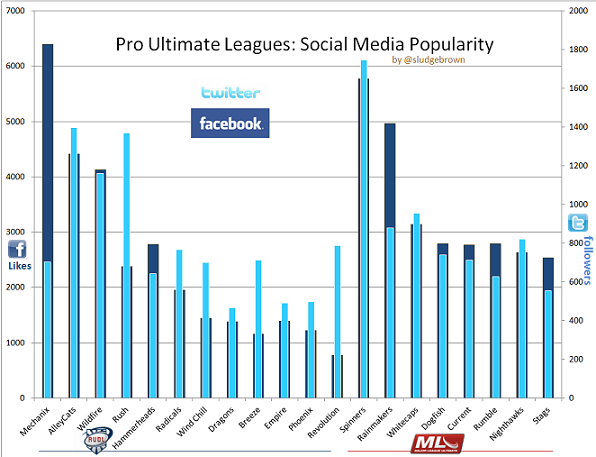 Now, how did professional Ultimate teams finish the season in the social media area? Past data: February 2013 . April 2013 . Pro Ultimate teams sorted by total (Facebook Likes + twitter followers), per league. "I like frisbees. 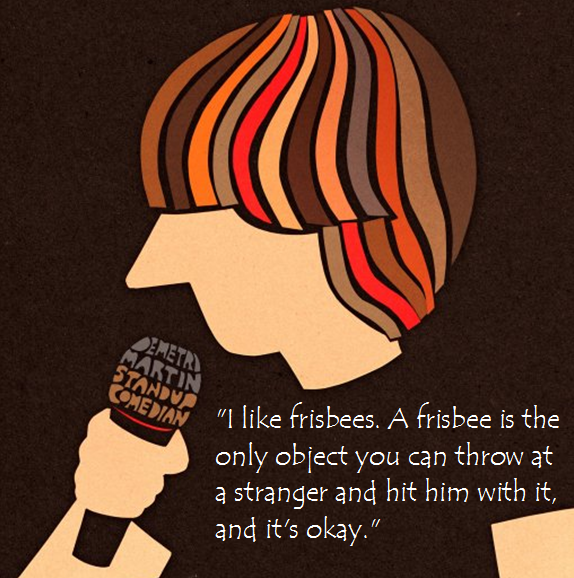 A frisbee is the only object you can throw at a stranger and hit him with it, and it's okay." In CNN's recent Human to Hero segment, which celebrates inspiration and achievement in sport, interviewed Mark Poole of Atlanta's Chain Lightning. 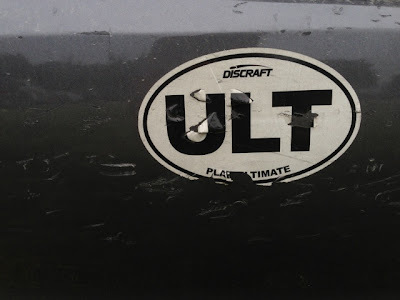 ...forget outdated notions of dogs scurrying after flying discs in the park, ultimate is a frenetic pursuit that blends aspects of football and rugby into a dynamic "frisbee" package. Ultimate is contested between two teams, each consisting of seven players. The aim is to pass your way into the opposition's end zone, just like in American Football, but once in possession players aren't allowed to run with the disc. Over four, 10-minute quarters, players are constantly harrying round the field of play creating space, executing a variety of throws -- including the "hammer" and the "scoober" -- and flinging themselves around attempting to catch the disc. Poole says any budding players must be equipped with the three pillars of ultimate: to run hard, jump high and throw far. But while the game moves at a fast pace, respect is a key component, because ultimate is ultimately self-policed. 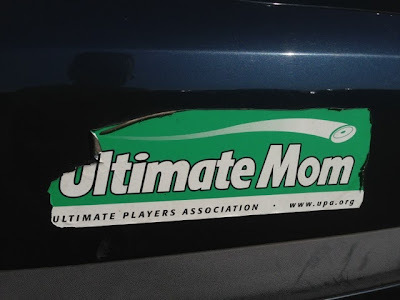 Ultimate now has two pro leagues in the United States and interest is growing, but for now [club] players are doing it purely for the love of the game. 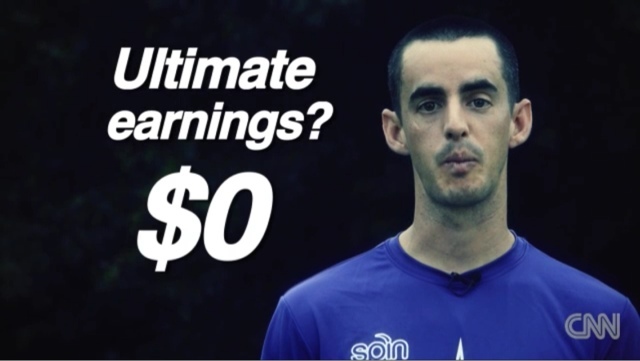 Mark Poole: "I make zero dollars playing ultimate, but I spend way more than that." Discraft USNT disc, bumper sticker, hand-written card & receipt. Go ahead, $upport Team USA. 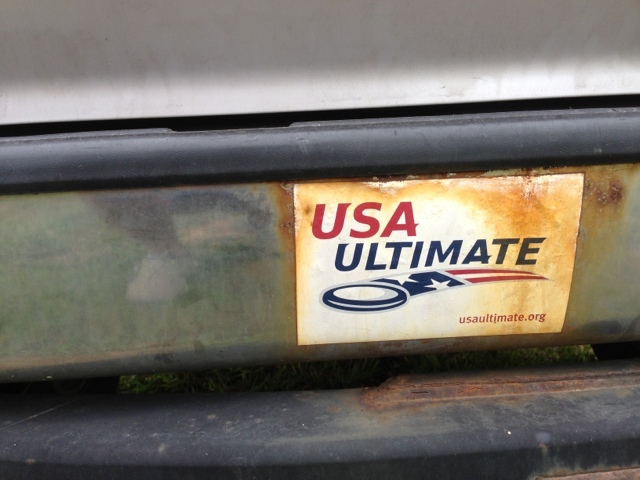 Spotted this NY license plate at the 2013 Chesapeake Invite in Leesburg, Virginia. 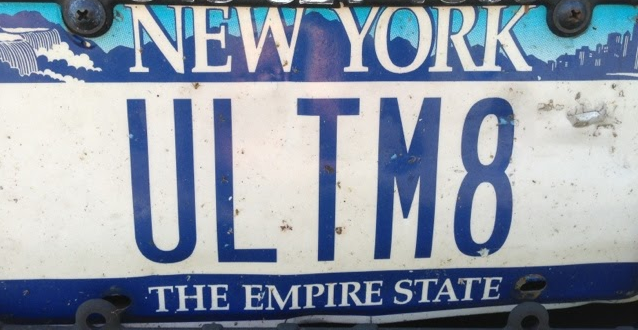 Is it better than this vanity plate? 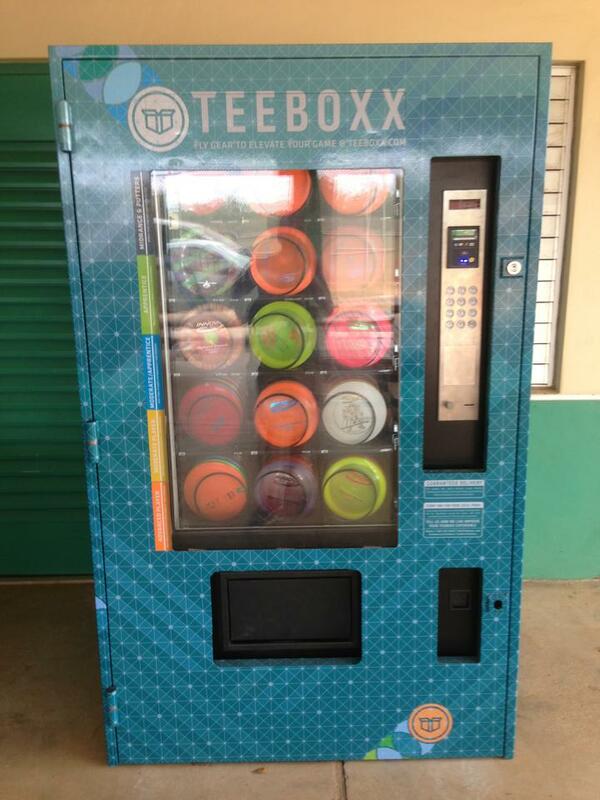 New York license plate "ULTM8"
Now presenting...the world's first self-contained Disc Golf Pro Shop, invented by TeeBoxx Disc Sports. This vintage commercial for Wham-O's Frisbee is better than their 1980's commercial. Intro: What's a Frisbee? A Frisbee's fun! It's a flying saucer that you command. WATCH! 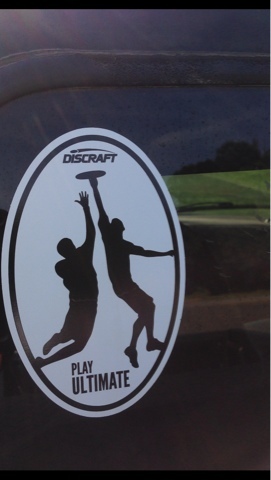 This is the way to hold a Frisbee. This is the way to boomerang it! Every Monday morning. Afternoon & evening. It lifts like a plane (or a flying saucer). And, it twirls around like a gyroscope. Frisbee's the way to lots of fun. At the park, or a beach, or picnic. For everyone of the family. For everyone of the family! The 2013 FPA World Championships starts today in Santa Cruz, California. Per the press release, 100 disc athletes from Italy, Germany, Czech Republic, Austria, Switzerland, Sweden, Colombia, Japan & the US will compete in the Open Pairs, Mixed Pairs, Women's Pairs and Co-Op (threeway) divisions. INFO: Freestyle Disc is a sport that features hot tricks as the disc athletes perform 4-5 minute routines, choreographed routines to music, which are judged on 1) difficulty, 2) execution and 3) artistic impression. The team with the highest score wins (30 is a perfect score). "Frisbee is a game of catch. [Freestyle players] do a lot of things between the throw and the catch." Freestyle Frisbee: World Disc Jam from beachjammer on Vimeo. 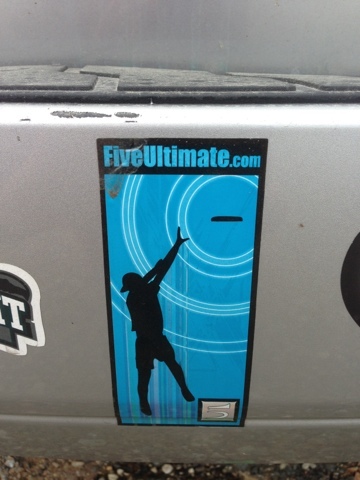 What cities will American Ultimate Disc League expand to in 2014? Only a fraction (one-third) of the originally planned 2014 expansion teams will be selected to join the 12 existing teams. 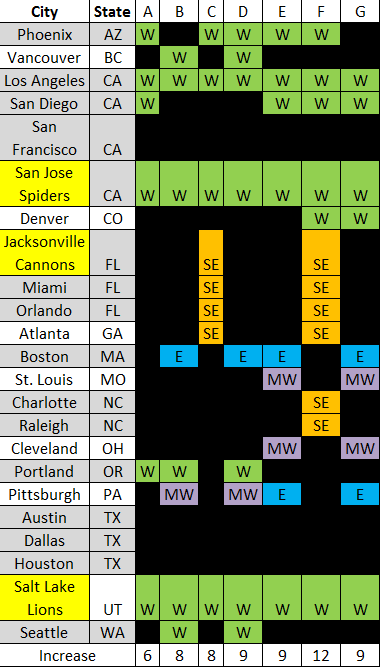 A few scenarios of AUDL 2014 expansion cities. W=western division; E=eastern div; MW= midwestern div; SE=southeastern div. > The AUDL Coverage Map shows 23 locations identified for the 2014 expansion plans. > The AUDL Commissioner mentioned 4-8 more teams will play next season. > It's assumed, unlike in 2012, that all 2013 teams will be returning. > The San Jose Spiders website shows 3 teams already deemed as expansion teams. Homer: So dad, what kind of stupid idea did you put in Lisa's head? Grampa: She wants to steal a kiss like "Pyramus and Thisbe." Homer: Did you say "Ultimate Frisbee?" A beach & a flying disc make for a perfect backdrop to market swimwear. Athleta - GAP's athletic clothing line for women - uses a Frisbee in their ad for their Zanzibar Board Short. Looks like a 175-gram disc of the Wham-O variety. 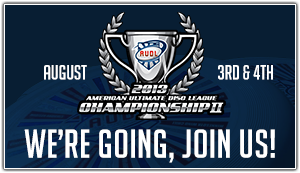 The AUDL 2013 season is over. Just like in 2012, it's time to reflect on ways for the second year of this semi-pro Ultimate league to improve next season (2014) when there are 4-8 expansion teams expected to join. Marketing. Promotions for the post-season's final 3 games were really good; except, where was that type of hype for the previous 98 games?? Also, expand UXtv's coverage league-wide to capture all games, and showcase your product of professional Ultimate to a wider audience. One immediate impact the AUDL Network/UXtv will have is an improved promo for next season. Your weekly text previews were buried on your website and would benefit by adding logos to boost team identity. AUDL team logos were better, but there's still room for improvement. Add a video recap of weekend games. The 'Top 10 AUDL plays' were good, although I'm not a fan of the pixelated recordings. Weekly recaps via Skyd Magazine were concise, yet regularly lacked actual game highlights. Combining these two ventures (recap + top plays) would be welcomed. This great sport is not meant to be captured with sucky low quality video. READ: Use hi-def! Encourage more sponsorship on jerseys. The jerseys are an open canvas & a walking billboard. Team branding is important, but there is enough material to splash some corporate logos on those uniforms. 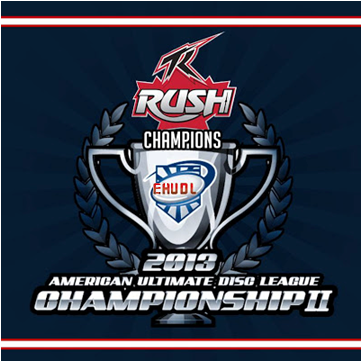 Consider increasing the size of the AUDL logo on the sleeve to plug the league. More detailed standings. The standings were much improved from last year. The game-by-game results chart was a nice visual, until it was removed from the website in early July. Posting league leaders in assists and goals thrown/caught was a positive. 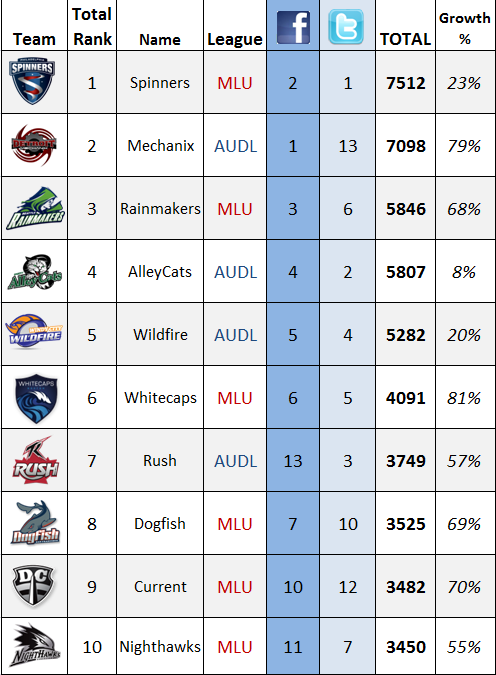 Make it mandatory for all AUDL teams to post league standings on their homepage. Timing. The 48-minute game drags on too long; consider reducing each quarter by 1-2 minutes. The season is a bit extended; consider limiting to 12-14 regular season games. 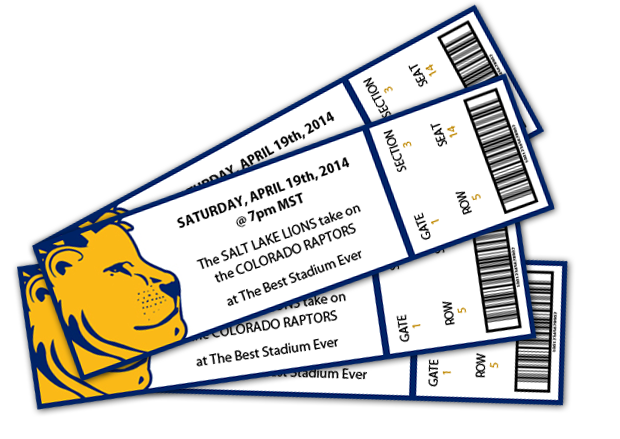 The play-in game before the conference championship made the post-season extra special. Still baffled at your concurrent promotion of UXtv during the play-in game, though. Update websites regularly. Again, an outdated website portrays a poor image to potential fans (& sponsors). Websites like Dragons, Hammerheads, Revolution, Wildfire & Mechanix that utilize the AUDL website template have similar layout and, thus, aid navigation. In my opinion, any AUDL team found not updating their website should be banished from your "professional" sports league. LOOKING AT YOU, DC BREEZE! Track Integrity Rules. This rule is supposed to be a distinguishing feature of our sport. By not recording its application, it becomes less special. THE Ultimate jersey. Team are relying on the sublimated jerseys which is still just a fancy T-shirt. If the shirts are not going to have a distinctive feature about them, then at least consider establishing design guidelines for the shirts (e.g. size of type; logo sizing, location of team name). For what it's worth, wrapping the design around the side of shirts looks gawky. Add field players. Add one more for 8 players to be on the line. 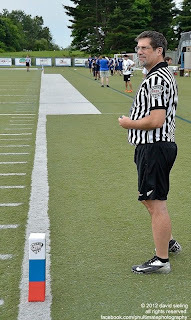 I know, 7 is so traditional, but the adaptive AUDL game now has timed quarters and refs. The additional field space could easily handle 16 players for this action-packed sport. Modify end zones. It makes sense to want to use the existing football field dimensions. The problems are the AUDL end zones are twice as big as the football EZ's, and 20 yards is just too much space to defend. Consider using the existing 10-yard endzones like you are using the current sidelines. NOTE: I'm first & foremost a fan of Ultimate. I attended multiple AUDL games in DC and followed the 2013 season. These suggestions are meant as constructive feedback to support the sport. Washington DC's Truck Stop (2012 Mid-Atlantic Region Champions) hosts an Ultimate friendly versus London's Clapham Ultimate (2012 European Champions). Why: CU is travelling to the DC-area to participate at the Chesapeake Invite. Cost: $5 at the door. Tix proceeds to Robin & Molly Poullath's Be the Match Team Drive. 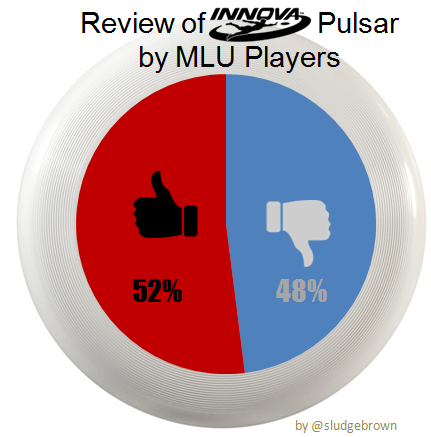 MLU's Commissioner Snader & VP Nic Darling answered questions on social media yesterday and provided insight into changes/improvements to the 2014 season. 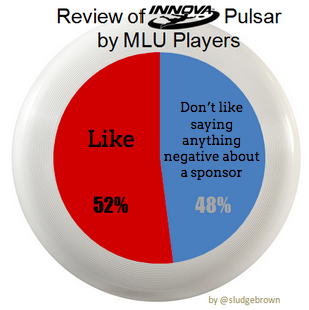 One of the more interesting reveals was about their official disc - the Innova Pulsar. better or saw no difference." RELATED: Weekly snapshots during the season. 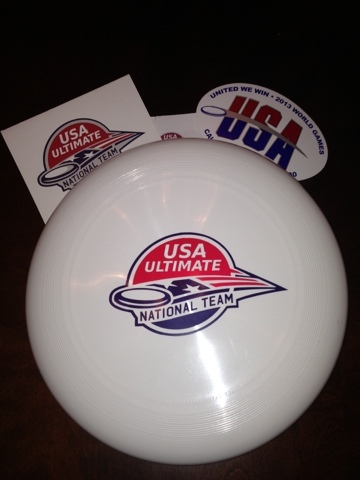 There's been lots of recent chatter about expansion in the professional Ultimate leagues. AUDL has been claiming an expansion of "16-20" more total teams (67% growth) while the MLU has halted plans to expand into the midwest (0% increase). 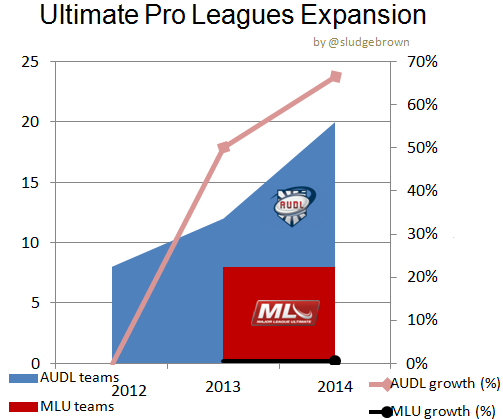 NOTES: AUDL started in 2012; MLU started in 2013. 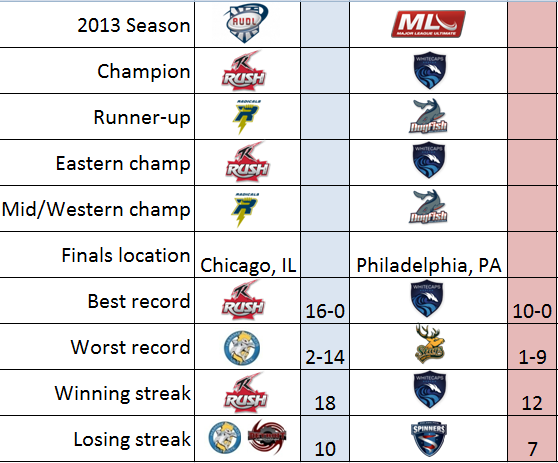 Not all AUDL 2012 teams continued in AUDL 2013. 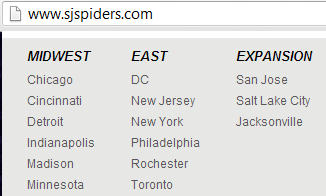 There are 23 cities listed as "AUDL 2014 Expansion". Per MLU "New teams are in development but will not be added in 2014." Comfy shoes can morph into comfortable Ultimate cleats?! Knowing about this company that CONVERTS SHOES INTO CLEATS is music to my feet's ears! "We Bring Comfort Back To the Game"
Info: Custom Cleats (Medford NY) combines almost any sneaker or turf shoe with any type of cleat. Most cleat manufacturers design cleats that are very narrow and with little padding for the bottom of your feet. Athletic sneakers are designed for both durability and comfort. They provide a layer of foam that absorbs the shock of the ground along with a wide enough pattern so the toes of the foot are not overlapping. We utilize that comfort provided by the sneaker and transform it into a cleat! Conversion takes 5-6 business days. Price: $85.00 per conversion into plastic molded or metal cleats. Turf bottoms, football bottoms, or footjoy golf bottoms are an additional $35.00. Three pro ultimate games - all AUDL post-season games - were played this past weekend. See past data. [AUDL] The AUDL Finals were played outdoors for the first time in its history. The Conference Championship games & AUDL Finals were played in Chicago, Illinois. [AUDL] 3 = number of times Wildfire scored 16-or-less this season, ALL against Radicals (Win 16-15, 5/12; Loss 13-15, 6/29; Loss 15-21, 8/3). 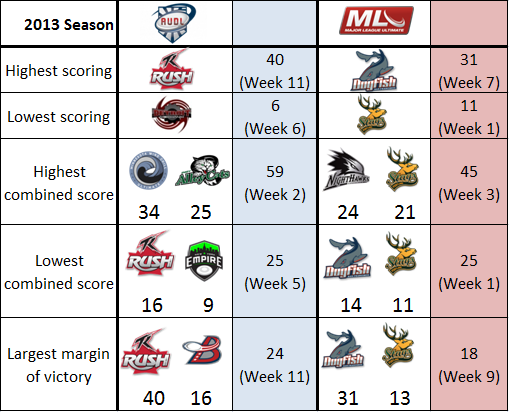 [AUDL] With their playoff wins, Rush is 4-0 against Empire, & Radicals are 3-1 vs Wildfire. 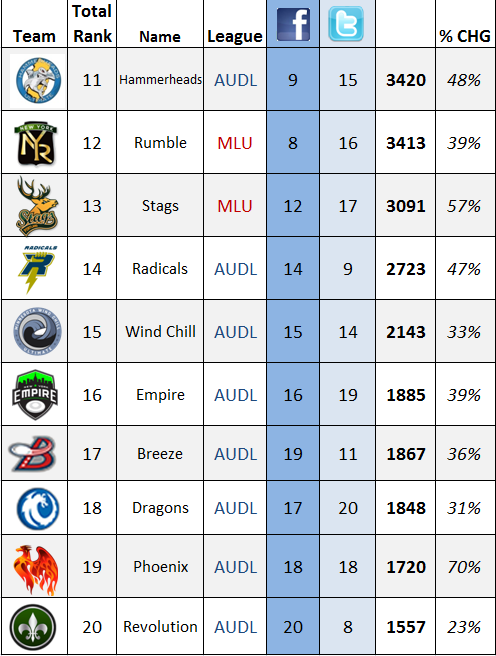 [AUDL] ~$193 = earnings per Radicals players by winning AUDL's 2013 Midwestern Conference ($5000 team total). 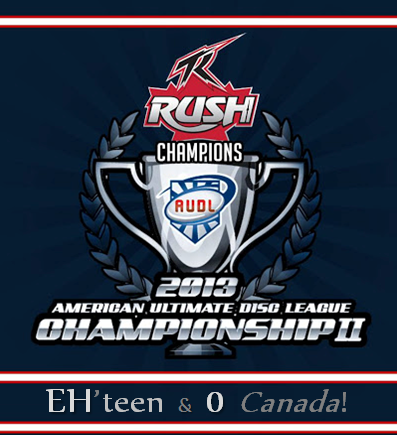 [AUDL] 5-0 = Rush's season record in back-to-back weekend games (4/20-21; 4/27-28; 6/29/-30; 7/13-14; 8/3-4). [AUDL] 8 of 18 Radicals games were decided by 2 scores or less; losing 3 of those 8. [AUDL] +2 scores = margin of victory by Rush in the Finals; their closest margin since April 21 - a 1 score win vs Phoenix. 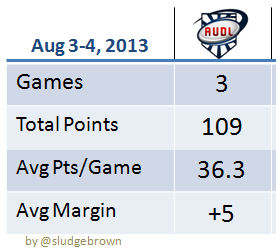 [AUDL] 14 = scores by Radicals in their Finals loss; their lowest scoring all season. [AUDL] 16 = scores by Rush in their Finals win; matches their lowest scoring of the 2013 season (a 16-9 win vs Empire on May 12). [AUDL] The AUDL Finals was the first & only inter-conference game of the AUDL 2013 season. [AUDL] 2-0 = Eastern Conference's all-time record in the Finals against the Mid/Western Conference. There is lots of individual preparation to get ready for an Ultimate Tournament. I was not prepared for what happened this weekend. The purpose of this post is for all players, clubs and Tournament Directors to be better prepared if a similar emergency happens at your Ultimate game/tournament. BRIEF RECAP: On Saturday, August 3, an Ultimate player suffered a heart attack while playing during a Washington Area Flying disc Club Ultimate Tournament in Reston, Virginia. Ultimate players were alerted of the emergency situation and administered CPR before EMS arrived. The player survived! The consensus of those present on Saturday was that the immediate efforts by Ultimate players contributed to the man's survival. As of 8/5, the player is in critical care at a DC hospital and will go in for triple bypass surgery once deemed safe to operate. As of 8/10, the player successfully had quadruple bypass surgery and recovering well. 1. Recognize the seriousness of injury. When minutes, and even seconds, are crucial in a health emergency, do not hesitate to take action. You. YES, you! 2. Locate a phone. Find the closest cell phone - it does not need to be yours - and immediately dial 911. 3. 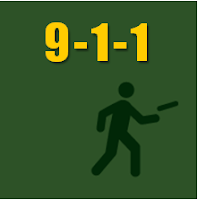 Be prepared to provide specific information for the 911 call. • Details about the emergency, such as a description of injuries or symptoms being experienced by a person having a medical emergency. 4. Find someone who can administer CPR. Spread out and call attention to yourself (e.g. yelling, shouting, waving arms). Stopping other games for emergencies is absolutely acceptable. 5. Ensure EMS vehicles can find their way to your location. If fields are not located right at the provided address, then consider driving to the entrance and leading EMS to the injury. Also, move any parked vehicles to provide easy access for the EMS vehicles to drive close/onto the field (i.e. unlock gates, move any parked vehicles blocking access to the fields). 6. Keep on-field pathway clear for EMS vehicles. Players should remain on the sideline and out of the way from the path of EMS vehicles. Remove any equipment that may obstruct, too. 7. Contacting the injured player's 'Emergency Contact.' The team captain, teammates &/or TD should have this information. Contact the listed person to inform them of the emergency situation and any further details EMS can provide (e.g. status, hospital location). 8. Provide support. Players and those in attendance may react in different ways. Some may want to talk about it; some may not. Some may not want to continue playing; some may want to. Overall, be respectful for how people react to an emergency event. Three post-season professional Ultimate games this weekend. These are the final professional Ultimate games of the 2013 season. Betting lines - the spread & points total (Over/Under) - for professional Ultimate are for entertainment purposes only. AUDL Playoffs continue this weekend with the 2nd place team playing the 1st place in each conference. These four teams are, by record and performance, the best in the league. The conference champion teams earn a $5000 prize and then play for the AUDL championship (& $15,000!) on Sunday, August 4 at 2pm ET. All three games take place in Chicago, IL. Saturday, August 3 @ 3p ET. Video stream by UXtv ($12.99). Radicals won 2 out of 3 games against the Wildfire- their only 2 losses of the season. The Radicals are the only Midwestern conference team to beat Wildfire at home - the very location of this conference championship. It's been a slim margin of victory in each of their past meetings; April 20 (+1, Radicals), May 12 (+1, Wildfire); June 29 (+2, Radicals). Saturday, August 3 @ 7p ET. Video by UXtv ($12.99). Rush won all 3 meetings (April 27, May 12, July 7) against Empire by 8 scores, 7 scores, 12 scores, respectively. MLU Championship concludes its inaugural season. Fixes. See how Team USA won gold at The World Games.